It’s a new way to blog, on a new type of platform. Today we’re excited to share a glimpse of the future for all the WordPress mobile apps. Drumroll please! I give you WordPress for webOS, available as a download for the HP TouchPad with support for more webOS 3.0 devices coming in the future. Here’s the run-down: It’s the first official WordPress app to have a full featured WYSIWYG (what’s this?) post editor. The app has been translated to all languages available on the TouchPad. It uses a “Sliding Panels” interface, which takes full advantage of the larger screen of the TouchPad and makes for fast and easy blog management on the go. Check out the video below to learn more! Of course the app also features everything else you’ve come to expect from a WordPress app. You can manage posts and pages, as well as add new ones. Moderation is built right in, and you can even reply directly to comments. If a comment comes in and you’re working on something else with your TouchPad at the time, you’ll get notified about it. Peruse the Stats panel for in-depth information on what your visitors like the most about your site. Another neat thing about this app is its use of “Cards”. This is a webOS invention that lets you stack screens belonging to the WordPress app in a single pile, making it very easy to, for instance, write a post while keeping the main window open. In fact, if you tap an email address in a comment, a compose email card will be stacked together with those of the app. Learn more about WordPress for webOS at webos.wordpress.org and follow @WPwebOS on Twitter for the latest news! Are you rocking a TouchPad? You can download WordPress for webOS directly on your device using the HP App Catalog. Just search for “WordPress”. Visiting on a device? Follow this link to download. Get involved! Just like all the other official WordPress apps, WordPress for webOS is an Open Source project that craves your mad programming skills. Head on over to the development section to learn more. Huge thanks to Beau Collins for some major webOS pwnage. We’d also like to thank our partners at HP for making all of this possible. So, what’s your favorite invention in WordPress for webOS? Comment detail view with a few comments pending moderation. Compose card using the WYSIWYG editor. Post detail view. The main sliding panel is collapsed. Stacked cards and notifications example. Video Press : How does it work? Just upload a video and we’ll take care of the rest! VideoPress converts your original video into multiple high-quality formats suitable for viewing on the web, downloaded to your desktop, direct from your television, or loaded onto your portable electronics. Capture videos, upload, embed, and publish. VideoPress is fully integrated with WordPress, providing the simplicity you have come to expect from your favorite blogging software. VideoPress intelligently selects the best quality video based on your blog theme, filling your full column of content. VideoPress supports most popular file formats and can even handle large file sizes (1+ GB!). Video stats are displayed alongside post stats using the WordPress statistics you already know and love. The VideoPress server framework is available under an open source license (GPLv2) and can be used to provide customized video solutions for self-hosted large scale-WordPress MU sites. Note that it requires significant PHP coding, video codec and system administration skills in addition to various server provisions. Patent licensing may be needed for select video and audio formats in your legal jurisdiction. Video that’s as easy as WordPress. VideoPress integrates seamlessly with your existing WordPress publishing flow. Upload new videos to your blog’s media library and we’ll take care of all the technical details including in post display, search engine optimization and social media integration. You can purchase VideoPress for $59.97/year as an upgrade to any WordPress.com blog. There’s also a plugin that let’s you use VideoPress with any WordPress.org blog. Our Flash and HTML5 video players automatically expand to fill the full width of your blog post. Search engines see your descriptive video content alongside the text and images already present in your post. Your videos travel with your blog’s RSS feed, allowing playback in Google Reader, iTunes, and other popular forms of playback. Publishing with video should be just as easy as publishing text or images to your WordPress blog today. Upload a video directly from your admin interface, via email, or through one of many WordPress mobile clients. Simply click the video attachment button from your new post screen to add video content into a new blog post. VideoPress transcodes your uploaded video into the most popular playback methods for desktop, mobile, and home entertainment software. We maintain your original aspect ratio and frame rates while creating up to three resolutions (400, 640, and 1280 pixel widths) in MP4 (H.264 video, AAC audio) and Ogg (Theora video, Vorbis audio) formats. We optimize every new video for visual and audio quality while still maintaining quick download times and wide playback compatibility. VideoPress works with popular video subscription software such as iTunes, Miro, or Zune. We deliver high-quality video to your viewers’ desktops, mobile handsets, and television to help you connect with your audience wherever and whenever they desire. Track video impressions, total downloads, seconds of video played, and the viral growth of your video inside your WordPress Stats interface. Compare statistics from your posts, referrers, and video actions inside a single integrated interface. We also support third-party statistics platforms such as Quantcast. VideoPress supports videos up to two hours in length and uploads up to 1 GB in size. Your video platform should not limit your storytelling or creativity. Our built-in embed and sharing tools help your video spread virally throughout the Internet. We even include a WordPress shortcode for easy inclusion on millions of WordPress.com and self-hosted WordPress blogs. Not everyone wants their videos to spread all over the web. VideoPress helps you restrict your content to your own sites or sites you select. Embeds, feed enclosures and other sharing options are completely optional. Our video player verifies each website displaying your videos has been explicitly granted permissions (if you choose to restrict your content). VideoPress stores your original uploaded files on our secure servers. If you ever choose to leave VideoPress for any reason you will have access to all your original uploads including full metadata and other descriptive content. Every VideoPress video is securely stored in multiple datacenters across the United States (Chicago, Dallas and San Antonio) and around the world through our multiple content delivery network (CDN) partners. Your videos are almost instantly available to a worldwide audience. We are firm believers in open-source and release most of the software behind VideoPress under a GPLv2 license. If you are comfortable compiling your own software, navigating patents and maintaining your own PHP-based software you can rest easy knowing your favorite publishing platform could some day run on your own servers. Today VideoPress was upgraded to OSMF 1.6, bringing better performance, lower power usage and a couple of new features. Adobe recently updated Flash Player to improve hardware-accelerated video decoding called StageVideo; VideoPress now takes advantage of the latest features of Flash Player for lower CPU and memory consumption in Adobe Flash Player 10.2 and above. 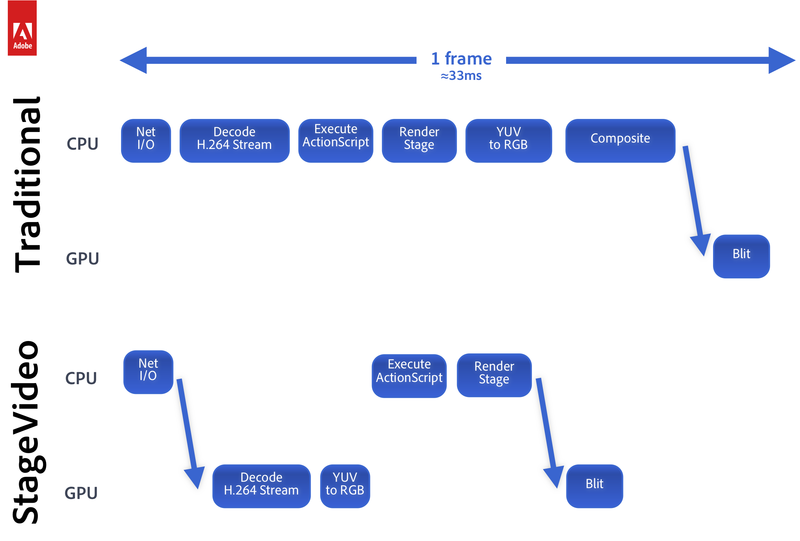 VideoPress uses Stage Video to split up video processing between multiple CPU cores, GPUs, and hardware decoders to improve video performance by up to 85% and decrease RAM utilization. For you, this means smoother video playback and lower power usage on netbooks, smartphones, tablets, and other low-power devices. Desktop playback will still deliver the same results great results you’re used to, now with fewer resources. The big new feature we’ve added today is progressive seek. Instead of having to wait for a video to download before you can jump ahead, VideoPress now supports seeking to any place in the video, without needing to load the entire video. This also means you can switch between HD and SD at any time and your video will continue playing from the same spot. Finally, for those of you who use multiple monitors, VideoPress will now play nicely in full screen mode – you can play videos on one screen, and keep doing other things on the other! VideoPress now supports HTML5 playback in supporting browsers without Flash playback support. Low-power devices such as smartphones can now play MP4 (H.264 video, AAC audio) and Ogg (Theora video, Vorbis audio) content natively in the browser. VideoPress also supports Apple’s AirPlay streaming technology to share video between supporting locally networked devices such as iPhone, iPod touch, iPad, and Apple TV. Videos with associated transcripts, such as WordPress TV, include WebVTT data for display by supporting browsers. VideoPress automatically selects the best video player for your viewers as they load the page. Visitors see a preview of your video’s content, including its title and preview image, before loading the full video by clicking anywhere in the preview area. This lightweight HTML-based preview helps the rest of your page load more quickly without requiring a player download or Flash plugin instantiation before a visitor has directly requested your video content. All content is integrated directly into your web page markup, not passed off to an iframe for remote viewing like other video hosts. VideoPress builds upon the unique qualities of your blog, including videos displayed in smartphone-optimized themes and smart markup exposed to search engines such as Google or social sharing sites such as Facebook and Twitter. The new VideoPress dynamic loader abstracts away the complexities of video publishing, helping you focus on creating great content built on WordPress. A new version of the VideoPress plugin for WordPress is now available. The latest release improves page assembly time, adds support for HTML5 Ogg Theora/Vorbis playback, increases the minimum version of Flash required for video playback, and includes autoplay support. We recommend all users upgrade their plugin through their blog’s administrative dashboard to take advantage of these new features, speed, and improved stability. Communication between your WordPress blog and VideoPress servers now uses a slimmer data response encoded as JSON. Information about each video is cached locally on your server, reducing the time needed to build page markup. Self-hosted WordPress blogs can limit video playback to free video formats unrestricted by known patent claims or intellectual property licensing hurdles. Set the Freedom level of all VideoPress videos via a blog setting or for individual videos via a shortcode parameter. Simply toggle the “Free formats” option under your blog’s media settings to display all VideoPress videos using an Ogg file container with Theora video and Vorbis audio. You may display individual videos in Free software formats by adding freedom=true to your VideoPress shortcode. The VideoPress plugin for WordPress now supports initiating video playback once the video object is loaded onto your page. Add a shortcode parameter autoplay=true to enable autoplay for individual videos. The shortcode parameter affects both Flash and HTML5 video playback options. Videos with restrictions, such as adult-rated content or embed privacy settings, will not autoplay. Advanced WordPress users may alter Flash parameters used by VideoPress for each video. Add a new filter action for the video_flash_params filter to customize style elements such as window mode or background color. Altering your Flash parameters may break playback so be careful. The minimum Flash version required to display our OSMF Flash player is 10.0.0. This value is now reflected in the SWFObject handlers included on each video page. VideoPress has a new look! The VideoPress Flash player has been completely rewritten on top of the Open Source Media Framework (OSMF). This new MPL-licensed framework led by Adobe provides common player functionality shared by most video players: play/pause, volume control, download progress, buffering, and more. VideoPress extends this shared foundation with custom skins, VideoPress-specific functionality such as video sharing and HD toggle support, and partner integrations including WordPress.com Stats, Quantcast demographics, and CDN providers. Partner integrations are much simpler through OSMF plugins offering advertising and analytics built by each potential partner. The new VideoPress player replaces the Embed menu with a new Share menu. Your video’s WordPress Shortcode and HTML embed snippet are now hidden behind a copy-to-clipboard button. We have also exposed direct download links for the highest quality video available in MP4 (H.264/AAC) and Ogg (Theora/Vorbis) formats. These download links were previously hidden within your blog’s RSS feed, available to podcatchers such as iTunes and Miro or direct download from a feed preview screen. Your viewers now have the option to download a high-quality video for full-screen viewing in their favorite desktop video player or on a television. We have renamed our blog-level and video-level sharing preferences to reflect this change. The new VideoPress Flash player includes support for the many written languages of the VideoPress community. Please visit our VideoPress translation page to help us support even more languages inside the VideoPress player. We are excited by the new player foundation and opportunity for future expansion of video playback features and partners. We’ve made some improvements behind the scenes with how we serve video files, and we’ve gotten a lot of postive feedback that it’s much faster for people now, that they can watch videos without any buffering or stuttering. So try it out. You can’t tell it from this blog, but we’re constantly making improvements and tweaks behind the scenes to make your video pressing experience as smooth as possible. VideoPress is built on top of many open source audio and video products. VideoPress source code is available under version 2 of the GNU General Public License for anyone to build upon, make improvements, and contribute back to the community. VideoPress uses the ffmpeg command line tool as well as libavcodec and libavformat from the FFmpeg project to convert video files from multiple source formats into an MPEG-4 Part 14 container with H.264 video and AAC audio as well as an Ogg container with Theora video and Vorbis audio. The FFmpeg project handles much of the heavy lifting between demuxers, decoders, encoders and muxers to deliver quality video. We use the x264 library to encode H.264 video tracks. We use the FAAC library to encode AAC audio tracks. The ffmpeg2theora command line utility helps VideoPress deliver consistent packaging in the Ogg container format with Theora video encoding and Vorbis audio encoding. The libogg library muxes video, audio, and metadata tracks into the Ogg container files used by VideoPress. The Vorbis audio library encodes audio for the Ogg container format. We rearrange boxes inside our MP4 files thanks to Mike Melanson‘s qt-faststart utility. A successful site presents some unique challenges. Whether it’s about hard news, fashion, or funny-looking pets, once your site has hit the big time, just keeping it going can be a full-time job — and you’ve already got one. VIP Support offers assistance, code review, security reviews, content migration, developer training, scalability advice, and general troubleshooting for enterprise users who are running large-scale WordPress deployments of WordPress (including multi-site), VIP Hosted sites, and Open Source WordPress plugins like BuddyPress. VIP Support provides access to many of the core WordPress developers and WordPress.com system wranglers who will make your WordPress deployment a success. There is free support available for WordPress and we think it’s fantastic, but we’ve found that some companies want more accountability. As the operator of WordPress.com — the world’s largest WordPress installation with millions of sites and hundreds of millions of monthly visitors — we are on the leading edge of all things WordPress. If you’d like our team to support you as you build your own large-scale WordPress, bbPress, WP.com VIP Hosted, or BuddyPress project, VIP Support is for you. Access to members of the WordPress development team to help you solve problems with your WordPress system. Unlimited number of support incidents. Software updates and upgrade notices. Introductions to third-party WordPress consultants and companies that offer custom development, design, and training. Full service content migration from your existing content management system to WordPress: $15,000 – $50,000 per site based on your data structure and current CMS. Who should use VIP Support? Anyone who needs extra help or peace of mind running their WordPress installation, though we primarily expect corporate users and other large-scale WordPress deployments to sign up. VIP Support is also required for those who have VIP Hosting and need development support for their site. The core development team behind the WordPress software and the WordPress.com hosted service which operates over 17 million sites using the WordPress software. When you sign up for VIP Support you get access to our private support forum. A support request is initiated through the forum. Your request may be either public and shared within the VIP Support forum or private and visible only to Automattic. If a bug in WordPress causes a problem that you report, we will assign a priority level to it which determines how soon we fix the bug. Level A: the bug causes the software to completely break. We will start fixing it within 24 hours and will get you a custom fix to the problem ASAP. Level B: the bug degrades the performance of the software but a work-around exists. We will fix the bug in the next scheduled release of the software. Level C: the bug has a minor impact on the software. We may fix the bug in the next release. How does the on-site visit work ? We’ll fly out to your offices and meet directly with your developers for a full day. A week before the visit, you’ll send us an agenda and/or a list of questions that you’d like covered, and as long as it’s WordPress related, we’ll address them as we work with your team. Which versions of WordPress are supported? The current versions of WordPress as well as one version previous to the current release. What does per seat mean? One seat equals one contact person. When you sign up for a support contract you will specify a contact person who will be interacting with us. If you would like to have multiple people interact with us, you will need to buy multiple subscriptions. We prefer this model to one that charges per server or per number of sites that you are operating. With a single contact you may also specify an alternate for instances where your main contact is on vacation. Simply fill out a short form and we’ll get back with you promptly. What’s an example of an issue that isn’t covered? VIP Support covers all issues directly regarding WordPress and Open Source WordPress plugins and themes such as BuddyPress as long as they are either custom or GPL compatible. The goal of the program is to work with your developers to troubleshoot any issues, help optimize the WordPress install, and to offer best practices on building a robust WordPress deployment. If you have systems and other issues that fall outside of WordPress – for example if you have a problem that is specific to your file storage configuration – we may not be able to assist. Other examples that are outside of VIP Support include questions about design/CSS or configuration of your web server. WordPress has enabled a new breed of publisher: people who create content on par with the Wall Street Journals and New Yorkers of the world. We recognize that not all publishers want to build or maintain the technical expertise needed to support their growing site. That’s where WordPress.com VIP Hosting comes in. We’ve invested thousands of hours and millions of dollars, and the proof is in the pudding: on any given day we do tens of millions of page views and hundreds of millions of hits on WordPress.com. We serve most pages in under a tenth of a second from geographically diverse datacenters. There are multiple copies of every bit of data synced from Dallas to San Antonio to Chicago, and we back up your data hourly. As part of the VIP Hosting program, you’ll be running on the WordPress.com infrastructure grid, home to powerful sites such as CNN’s Political Ticker, Dow Jones’ All Things D, The National Football League’s Official NFL blog, People Magazine’s Style Watch, Om Malik’s GigaOM, official blogs for communities like Flickr and the BBC’s Top Gear, and many other high-profile, enterprise, and high-traffic sites. Because of the nature of this program it is not open to the public — it’s intended for high-profile publishers, enterprises, and startups that we have a good deal of confidence in. You might be a good candidate for VIP hosting if, for example, you get more than 1 million page views a month on your site. Pricing is based on a flat rate starting at $2500/month for up to 5 sites and then $500/month per additional site (with a one-time setup fee of $1,500 per site) — but is flexible depending on your circumstances and number of sites. We also require that you signup your developer(s) to our VIP Support program. We only want to do a select number of these, so we can’t accept everyone who applies. That said, don’t be shy. We’re always interested in meeting new and interesting folks. to apply for VIP hosting or to get more information. Point the records for your domain name at your new WordPress.com VIP site. Create a free website or blog at WordPress.com. Theme: Responsive by CyberChimps.